WIRED: Telephone pole wiring is a metaphor for people being wired differently. And we are connected. ADHD CHALLENGES: The letters of the month are written to illustrate aspects of Attention Deficit Hyperactivity Disorder (ADHD). CHAIRS: I illustrated "choices" by painting chairs. STEPS: Inspired by the Twelve Steps of recovery, this theme considers the many steps I take in life. LAUNDRY: There are many insights in this common chore. TRASH: This necessary and sometimes mundane part of life--getting rid of stuff--deserves respect. ​BOUNDARIES: I examine personal boundaries through considering physical boundaries. 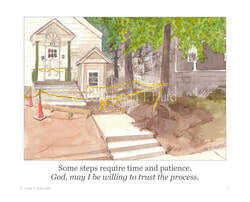 SIDEWALKS: I painted some of the stages involved in the construction of a sidewalk, showing the value of a process. THE KITCHEN SINK: I tried to see art in something that has been a challenge for me. It has some cool things to teach me. I have found more aspects of ADHD to illustrate. Click a theme "button" on the left to see illustrations and captions. Enjoy.